MEMPHIS, Tenn. — Elvis Presley™ is known and loved around the world as the King of Rock ‘n’ Roll™, and now his legendary Memphis home, Graceland, was voted #1 in USA TODAY’s 10Best Readers’ Choice contest for “Best Musical Attraction” from a field of iconic music-themed landmarks. As 10Best describes the win, “After four weeks of voting, one legendary attraction won the title of Best Musical Attraction by a landslide: Graceland.” Elvis Presley’s Graceland was voted into the top spot by readers of USA TODAY, who were asked to cast their online ballot for their favorite global music attraction from a pool of 20 museums, memorials, historic studios and epic record stores originally selected by 10Best’s travel experts and journalists. Voting began on May 11 and ran through noon EDT June 8, 2015. Based on the number of votes cast, 10Best announced that Graceland was a “clear favorite with our music-loving readers,” in their voting recap, which is music to the ears of Elvis Presley Enterprises, Inc. CEO Jack Soden. “This honor confirms what our guests from around the world have been telling us for years — that Graceland is a must-see destination, not only for Elvis fans, but for anyone who appreciates music and history. We have a rich story to tell here at the King’s castle, as we honor Elvis’ legacy and celebrate a music and pop culture revolution that started right here in Memphis, Tennessee,” said Soden. Additional nominees for Best Musical Attraction included the Rock and Roll Hall of Fame in Cleveland, Detroit’s Motown Museum, the famed Abbey Road studio in London and historic Apollo Theater in New York. Last month, Elvis Presley’s Graceland was chosen “Best Historic Southern Attraction,” by USA TODAY 10Best readers, ranking #1 in a list that included Colonial Williamsburg and Mount Vernon. 10Best is a division of USA TODAY Travel and USA TODAY’s award-winning travel website, providing users with original, unbiased, and experiential travel content of top attractions, things to see and do, and restaurants for top destinations in the U.S. and around the world. 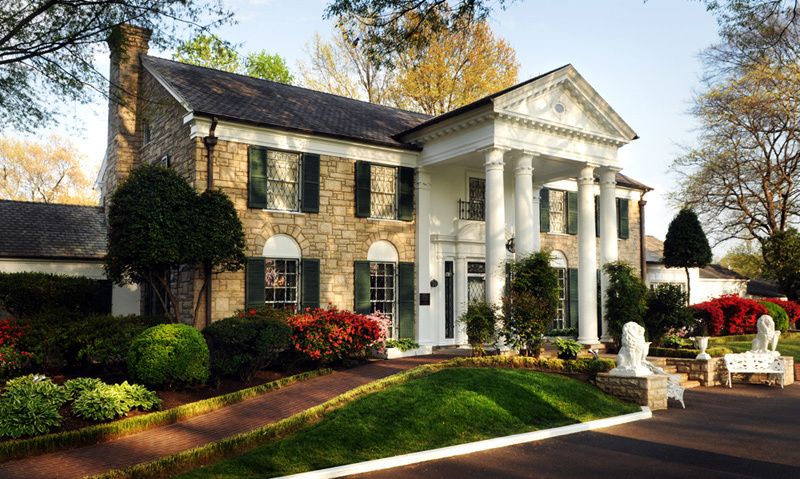 To celebrate the honor, Graceland offers the Get Closer to Rock ‘n’ Roll Package for visitors, providing guests a chance to “get closer to the man who changed the world with his music” when they visit the home he loved and lived in for 20 years. The package includes two nights at Elvis Presley’s Heartbreak Hotel, two VIP Tours of Elvis Presley’s Graceland, along with two tickets to fellow winners of the USA TODAY 10Best Musical Attraction Readers Choice award, Sun Studio and the Stax Museum of American Soul Music. Elvis Presley’s Graceland, in Memphis, is music’s most important and beloved landmark, with hundreds of thousands of fans from around the world visiting the historic home each year. Elvis Presley Enterprises, Inc. (EPE) manages the operations of Graceland, its related properties, including the recently-announced Guest House at Graceland 450-room hotel to be built in Memphis, as well as the Graceland Archives, featuring thousands of artifacts from Elvis’ home and career. EPE also produces and licenses Elvis-themed live events, tours and attractions worldwide, including “Direct from Graceland: Elvis at The O2” in London, and the new “Graceland Presents ELVIS: The Exhibition – The Show – The Experience” at the Westgate Las Vegas Resort & Casino. Graceland Holdings LLC, led by managing partner Joel Weinshanker, is the majority owner of EPE. In 2015, Graceland was voted the Best Historic Southern Attraction in the USA Today 10Best.com Reader’s Choice and in 2013, the #1 Iconic American Attraction in the same poll. For more information on EPE and Graceland, visit www.graceland.com.